[167 Pages Report] The global retail analytics market is expected to grow from USD 3.14 billion in 2016 to USD 8.64 billion by 2022, at a Compound Annual Growth Rate (CAGR) of 19.7%. Retail analytics has gained major market traction across the globe, due to its capability of analyzing the huge data volumes flooding the retail industry. Today’s retail environment is more competitive than it was a few years back. Retailers are struggling to stay ahead in the competition. Due to increased customer preferences and demand for one-click solutions, most of the retailers have started thinking of newer ways to cater to customers’ needs. Therefore, retail analytics has started gaining major traction among retailers to provide actionable insights from customers’ data. Analysis has been incorporated in every aspect of the retail space. Whether it is merchandising or customer management, retail analytics has offered proven solutions for every retailer. With rapid growth in online retail, it has become the need of the hour to utilize the tremendous volumes of data generated by every online click for strategizing promotional activities and trade promotions. The base year considered for the study is 2016, and the forecast has been provided for the period between 2017 and 2022. The unprecedented proliferation of internet connection has transformed the way the world interacts. Exponential rise in social media, cloud computing, and online banking is just the tip of the iceberg and has significantly improved the way consumers engage with the online world. Technologies such as IoT, connected devices, and smart cities are utilizing data more productively. Developed economies have leveraged the internet connection prolifically, and the majority of the new users are emerging from low and middle income countries that are centered across Asia. There is a golden opportunity for retail analytics software vendors to capitalize on this unprecedented growth of internet users. The rising eCommerce sector is changing the traditional way of shopping. Targeted email campaigns, social media advertising, increased levels of personalization, and cognitive analysis of customers are expected to be the key enablers driving sales numbers and increasing the effectiveness of customer loyalty programs. Moreover, with more connected devices, retailers would be looking toward adopting retail analytics to tap into the huge volume of data being generated. Real-time analysis of customers’ shopping behavior, market basket analysis, and loyalty analysis would be aimed at providing customized offers to increase customer retention. The research methodology used to estimate and forecast the retail analytics market began with data collection through secondary research on key vendors. The sources referred for secondary research include D&B Hoover’s, Bloomberg Businessweek, and Factiva. The vendor offerings were taken into consideration in order to determine the market segmentation. The bottom-up procedure was employed to arrive at the overall market size of the global retail analytics market from the revenue of the key players in the market. After arriving at the overall market size, the total market was split into several segments and subsegments, which were then verified through primary research by conducting extensive interviews with key personnel, such as Chief Marketing Officers (CMOs), and Chief Executive Officers (CEOs), Vice Presidents (VPs), directors, and executives. The data triangulation and market breakdown procedures were employed to complete the overall market engineering process and arrive at the exact statistics for all the segments and subsegments. The figure below shows the breakdown of the primaries on the basis of the company type, designation, and region considered during the research study. 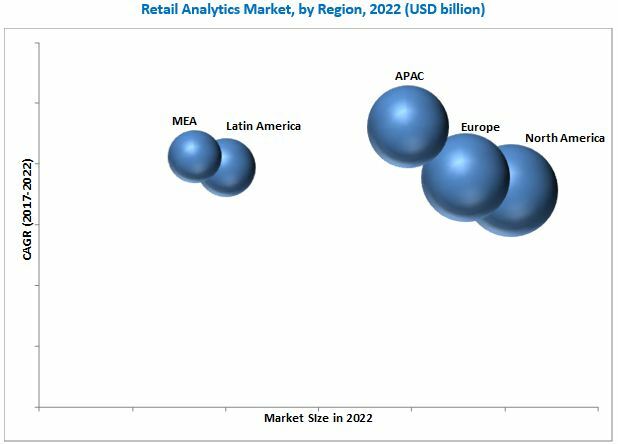 The retail analytics market comprises software and service providers, such as 1010data (US), Angoss Software (Canada), BRIDGEi2i (India), Capillary Technologies (Singapore), Diaspark (US), FLIR Systems (US), Fujitsu (Japan), GainInsights Solutions (India), Happiest Minds (India), Information Builders (US), IntelliVision (US), IBM (US), LoyaltyOne (Canada), Manthan Software Services (India), Microsoft (US), MicroStrategy (US), Oracle (US), QBurst (India), Qlik Technologies (US), RetailNext (US), SAP (Germany), SAS Institute (US), Trax (Singapore), Visual BI Solutions (US),and Zebra Technologies (US). These Retail Analytics Software Vendors are rated and listed by us on the basis of product quality, reliability, and their business strategy. Please visit 360Quadrants to see the vendor listing of Retail Analytics Software. In March 2017, Oracle launched the Oracle Retail Merchandising solution on the Oracle cloud platform. The cloud-based retail merchandising offerings optimize mobility, improve customer engagement, and enhance the user experience, thereby improving Oracle’s competitive position in the market.. In January 2017, Fujitsu launched a new version of Retail Engagement Analytics 2.0, a cloud-based solution that uses RFID and IoT technologies to monitor and analyze real-time customer behavior, and provide actionable insights to maximize sales conversion rates. The new solution features video analytics and queue management to help brick-and-mortar retailers collect and analyze a variety of data sources for improving the overall customer retail experience. In October 2016, IBM introduced new Watson solutions aimed at professionals working across a gamut of business functions, such as marketing, commerce, supply chain, and human resources. The company offers IBM Watson Customer Experience Analytics to comprehend a variety of customer behavioral patterns, such as shopping patterns and buying trends. What are new application areas which the retail analytics companies are exploring? The global retail analytics market is expected to grow from USD 3.52 billion in 2017 to USD 8.64 billion by 2022, at a Compound Annual Growth Rate (CAGR) of 19.7%. Growing internet penetration, advancement in technologies such as machine learning, AI, and augmented reality, increased use of data-intensive platforms and rapid adoption of social media are the key factors driving the growth of this market. Retail analytics has started gaining major market traction among retailers to provide actionable insights from customers’ data. Analysis has been incorporated in every aspect of the retail space. Whether it is merchandising or customer management, retail analytics has offered proven solutions for every retailer. Due to the rapid adoption of the online retailing, it has become the need of the hour to utilize the tremendous volumes of data generated by every online click for strategizing promotional activities and trade promotions. 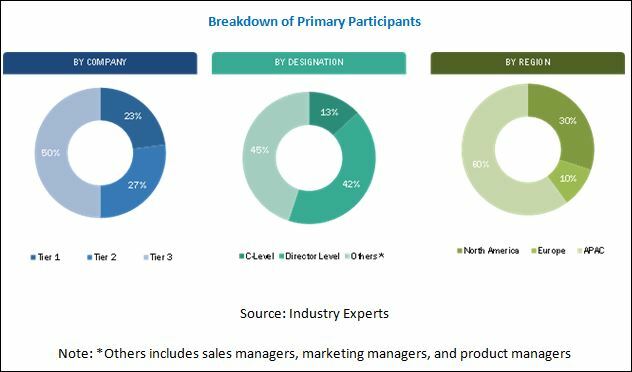 The retail analytics market has been segmented based on applications including merchandising analysis, pricing analysis, customer management, performance analysis, yield analysis, inventory analysis, and other applications such as assortment and order optimization. The market for customer management application is expected to grow at the highest CAGR between 2018 and 2023. The customer management and analytics portfolio enable the retailers to deploy personalized engagement on data driven insights about customer behavior. The solutions are designed to create ideal responses for every single customer interaction. The key requirement for understanding consumer behavior is getting quantified data on real-time consumer activities. Vendors provide consumer management analytics solutions that help in consistently tracking the quantity and frequency of product purchases, frequency and duration of customer visits, price sensitivity, mostly preferred areas of purchase, customer response to promotional activities, and such. The retail analytics market in APAC is expected to grow at the highest CAGR during the forecast period. Increasing digitalization and growing internet penetration have resulted in increased number of eCommerce retailers in the APAC region. Additionally, rapid growth of faster internet services coupled with increased use of mobile devices is creating stiff competition in the retail analytics market in the region. The region is witnessing an increasing demand for cloud-based analytics solutions, owing to the increasing size of SME retailers. Companies operating in the APAC market continue to focus on improving customer service to drive market competitiveness and revenue growth. Fast-growing countries such as China, India, Vietnam, Malaysia, and Thailand are rapidly adopting advanced retail analytics solutions. The growing demand for the effective analysis of changing customer needs has been a major factor for any retailer brand to sustain in the competition. This totally depends on how effectively the retailers have adopted different analytics software that provide them actionable insights about changing customer needs. Vendors operating in the retail analytics market have invested in R&D domains to provide data driven solutions that better meet the retailer’s requirement and analyze the changing customer preferences. Merchandising analytics provides analytical insights for huge data volume of store-based operations. Retailers have identified product pricing as one of the most prominent aspects of their growth and have worked accordingly on refining their overall pricing strategy. In-spite of the fact that predictive pricing models offered by different software vendors can manage their pricing and promotion strategy, enterprises have focused on implementing full-fledged profit optimization tools. Performing smart competitive pricing analysis can provide retailers with quick accelerated growth. The customer management and analytics portfolio enable the retailers to deploy personalized engagement on data driven insights about customer behavior. The solutions are designed to create ideal responses for every single customer interaction. The key requirement for understanding consumer behavior is getting quantified data on real-time consumer activities. Vendors provide consumer management analytics solutions that help in consistently tracking the quantity and frequency of product purchases, frequency and duration of customer visits, price sensitivity, mostly preferred areas of purchase, customer response to promotional activities, and such. Performance analysis is a critical application in any retail analytics software. The solution can gauge the performance indices of both high-performing and low-performing brands. Moreover, the software can also be helpful to measure the capabilities of a workforce and determine how much business they are able to generate for the company. Yield (Demand) analysis is one of the pertinent key application areas for retailers. Retailers want to estimate or forecast the consumer demand for a product or service. It is one of the most important considerations taken for a variety of key business decisions such as sales forecasting, marketing and advertising spending, expansion planning, and numerous other manufacturing decisions. Involving predictive as well as prescriptive analytics could help to forecast the demand properly. Moreover, involving prescriptive analytics could also be instrumental in identifying key business areas, which are high in demand and need special attention. After demand analysis, inventory management is one of the topmost concerns for the retailers. The ability to swiftly replenish the sold-out or defective items is one of the key differentiating factors for retailers doing business in this competitive era. Moreover, as the technology is becoming more advanced and pervasive, analytics would help retailers to gain a strong control over their inventory. For instance, predictive analytics would be useful in tracking economic indicators, promotions, and discounts to help retailers optimize their supply chain adequately. What are the upcoming industry applications for retail analytics? High initial setup cost is among the major factor restraining the growth of the market. As compared to conventional solutions, the initial cost incurred for deploying retail analytics solutions is quite high, due to the involvement of business intelligence and data analytics expertise. Though the deployment of retail analytics solutions would reduce the operating costs by providing actionable insights, streamline team efforts to receive actionable insights from the collected data, and enhance the overall enterprise performance, the initial cost required to set up retail analytics solutions may act as a barrier. Therefore, the adoption of retail analytics solutions may exhibit a slow pace in small enterprises. Key players in the market include 1010data (US), Angoss Software (Canada), BRIDGEi2i (India), Capillary Technologies (Singapore), Diaspark (US), FLIR Systems (US), Fujitsu (Japan), GainInsights Solutions (India), Happiest Minds (India), Information Builders (US), IntelliVision (US), IBM (US), LoyaltyOne (Canada), Manthan Software Services (India), Microsoft (US), MicroStrategy (US), Oracle (US), QBurst (India), Qlik Technologies (US), RetailNext (US), SAP (Germany), SAS Institute (US), Trax (Singapore), Visual BI Solutions (US), and Zebra Technologies (US). These players are increasingly undertaking mergers and acquisitions, and product launches to develop and introduce new technologies and products in the market.